Or are we also concerned about peace and security in the region? Are we trying to open doors that will bring North Korea into the community of nations? Or are we trying to sow the seeds of Korean unification? Do we wish to promote democratic decision-making at the grassroots level in order to improve the implementation of human rights? Or are we trying to achieve access to the people in order to undermine a regime that we believe oppresses its people? Are we concerned about improving the economic standard of the DPRK so that it will be less costly to reunify the country in the future? Or are we providing education toward market capitalism in order to utilize North Korea’s cheap labour? Do church-related organizations wish to prepare the ground for religious freedom? Or do they wish to prepare the ground for access to missionaries and proselytizers? We cannot answer the question “what works best” if we do not take into consideration our often unstated goals or ulterior motives. Works best in what circumstances? When I arrived in Pyongyang in 1997 at the height of the famine, our purpose was simple and clear. It was an emergency operation to mitigate food shortages due to several years of natural disasters. Despite concerns about diversion of commodities, the operation succeeded in mitigating the famine. It worked, even though many critics will dispute whether it worked best. On my office wall in Pyongyang I had a UNDP poster with the words: “The emergency is over… what next?” Emergencies are not supposed to last forever. The next stage has to be a process of economic and food-secure development. 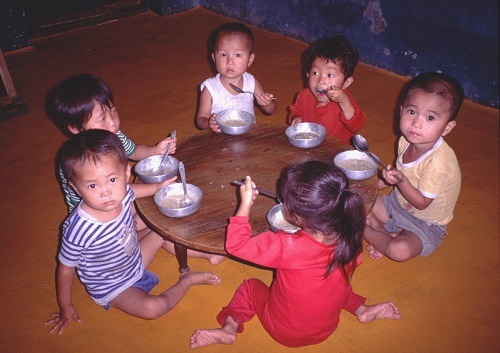 At the end of the year 2005, the DPRK announced it no longer required food aid, but would welcome development assistance. They followed a lesson that we had taught them: food aid is sometimes necessary in case of emergencies, but development is better for a long-term solution. Unfortunately, what might have worked best theoretically or professionally was simply out of the question geopolitically. Works best within what time frame? What would have worked best for the hungry population in 2006 might have been a massive development programme aimed at food security. But the timing of such a programme was simply premature for numerous reasons. What works today may no longer work tomorrow. Conversely, what has failed today may hold the key to tomorrow’s success. And this is particularly true in the situation of the Korean Peninsula, where the goalposts are constantly shifting. We cannot be certain that an assistance model or strategy that may have worked best in one period of time will also work best in another. Who should determine what works best? I am one of a dying breed of humanitarians who does not feel comfortable with a business-oriented results-based approach to humanitarian and development aid—especially in a situation as unpredictable as the Korean peninsula. Politics, economics, and human nature in general do not always—or ever—follow logical or predictable paths. What we plan to do may turn out to be impossible to implement. Or we do exactly as planned, but the results take us completely by surprise. And sometimes the byproduct of what we do may become more important than the results we plan to achieve. By now we have a veritable banquet of reports about programmes that various agencies have implemented in the DPRK over the past two decades. I would be loath to suggest that any of them have failed to achieve their very best. In fact, I want to congratulate all those who continue to work with and in the DPRK for the benefit of its people, and I have absolutely no doubt that this work is crucial for the future of the Korean people, whether or not these programmes have achieved their predicted or intended results. In his book “Getting to Yes in Korea”, Walter C. Clemens Jr. shows how different schools of political science—realists, neorealists, liberal idealists and constructivists—cope with the uncertainty that dominates the Korean peninsula. What is deemed by one group to work best is often bitterly opposed by another group. We have a similar problem in the humanitarian community, where human rights activists and aid agencies have been at loggerheads, with little sign of evolving agreement. Human rights workers have complained that any accommodation with the DPRK regime condemns most citizens of North Korea to continued suffering. From their perspective, undermining this regime is the best service we can render. In most cases, people who ask me “what works best” aren’t interested in linguistic analysis. They are aware of my personal history with the DPRK, which spans more than 25 years and includes two and a half years living and working north of the Demilitarized Zone. It is insights based on my practical experience—not my theoretical knowledge—that they wish to tap. Many of them struggle with the question of how best to invest financial and human resources and energies in the pursuit of the betterment of the North Korean people. They want to know in practical terms what types of projects they should support. If I were offered a million dollars for an assistance programme in the DPRK, how would I spend that money? In order to make my answer more broadly relevant, I am going to ignore the identity of the donor. Donor expectations sometimes limit the flexibility and creativity necessary to operate in a volatile or restrictive environment like the DPRK. I am also going to ignore the identity of the implementing agency. Sometimes the aims, purposes, nationality or available expertise of an NGO or humanitarian agency is not suited for conditions that prevail in the DPRK. Let’s pretend that my fictional donor has no demands on me and that I have a free hand in choosing models and strategies that work best according to my own criteria. What are my criteria? Let me expose some of my biases and ulterior motives. One might think of them as short- and long-term objectives, or perhaps just hopes and wishful thinking. I wish, therefore I hope. My hope for all Koreans is the same as my hope for all humanity: that every person may have adequate food, shelter and health care, the ability to realize their full potential, and live a life that corresponds to their aspirations and beliefs, free from coercion or manipulation. How would my project promote human rights? By choosing activities that demonstrate our concern for every individual, regardless of social or political status. By explaining how our project contributes to the implementation of human rights. By fostering the learning of problem-solving skills at the local level, without unnecessary recourse to central authorities. By nurturing the idea that local officials should be accountable to the community and responsive to its needs. I don’t see how anyone involved with Korea can ignore the fact that it is the theatre of the last vestiges of the Cold War. Earlier this year we rediscovered that the adjective “cold” doesn’t do justice to the Korean reality. Military exercizes and brinkmanship keep us on the knife-edge of an impending regional conflagration. I would therefore add “peace” to my list of ulterior motives. How can a small project contribute to world peace? By sharing with local counterparts information about what goes on in the rest of the world. By demonstrating the concern people outside of Korea have for people inside Korea. By illustrating that a reduction of tensions increases creativity, productivity and the solution to problems, both locally and internationally. By showing how atmospherics can help or hinder the process of negotiation. By demonstrating that win-lose propositions can be transformed into win-win scenarios. I am somewhat partial to the hope that Koreans will regain a unified country, largely because I empathize with the pain of separated families, and the injustice inherent in a situation where one side enjoys some of the world’s greatest riches, while the other part lives on the edge of starvation. How can I contribute to the goal of reunification? By reassuring North Koreans that the people of South Korea also yearn for reunification. By recounting my history of relationships with South Korean friends and colleagues and my experience in organizing direct official contacts between North and South Koreans at a non-governmental level. By offering to involve South Korean or—if that proves impossible for political reasons—overseas Korean experts in local projects. By organizing events in third countries to which both North and South Koreans are invited. My intermediate goal is to contribute to the transformation of a closed society into an increasingly open one. I would like to do what I can to assist the DPRK to enter the community of nations. My counterparts should get a glimpse of the outside world through my projects. My hope is that outside contact will teach new ways to improve the DPRK economy, help in the proliferation of small-scale enterprises and energize local markets. Opening doors and windows into and out of the DPRK may help to increase understanding, reduce tensions and fears. A sense of security is the first step towards peace. Primarily by building and nurturing relationships. And that means creating an atmosphere of trust. Too many NGOs have come to the DPRK with unrealistic expectations that were translated into demands and conditions. Anyone who hopes to run a successful project in North Korea must be aware not only of their own limited “humanitarian space”, but also of the limitations under which their DPRK counterparts have to labour. We must keep in mind the unequal power configuration that forms the basis of our relationships. We have the power of our commodities and expertise. They have the power of denial. They want the goods, we want the access. All the same, it is their country, and we are their guests. We must begin where they are. Humanitarian principles have to be demonstrated, not preached or demanded. In the short term, I aim to mitigate—however modestly—the suffering of North Korea’s people. I hope to reach those who suffer the most and do so in the shortest period of time. The humanitarian community has had almost 20 years of experience delivering assistance to the DPRK, and we have learned many lessons in the process. I wish to profit from those lessons both in choosing my project and in the way I organize and carry it out. Normally we have little choice, since the DPRK authorities assign counterparts. However we can insist on lines of communication with the highest possible authorities and appropriate professionals. The higher authorities are needed to assure the maximum amount of access to beneficiaries and to remove unforeseen roadblocks to the success of the project. The involvement of professionals will enhance pride and local ownership of the learning process, giving it a greater chance of becoming entrenched and expanded. The North Korean people have so many needs, that there is no shortage of sectors on which to spend my million dollars. How will I choose? I am not interested in simply delivering commodities. Instead of food deliveries, I would prefer food security projects. Instead of medicines and vaccines, I would prefer a project that tackles the problem of public health, education for disease prevention and health promotion, or programmes for maternal and child health. An important aspect of initial negotiations is to choose the location for the project’s implementation. This requires knowledge of the DPRK geography, the areas of greatest need, and awareness of where other agencies are working. I would wish to avoid overlap with other projects, and operate as far from Pyongyang as possible. A resident operation, with full-time international and local staff is the ideal most NGOs strive for. Unfortunately, in the foreseeable future that route is closed to me as a Canadian. The only current recourse available is to create projects that require repeated visits by external organizers, technicians and educators. Minimum access requirements need to be negotiated ahead of time, and will most probably have to be linked to delivery of inputs. Since building relationships is such a major part of any project, I would choose projects and methodologies whose implementation involves the largest number of local people. All projects require the import of equipment. However it is preferable to avoid machinery that is difficult to maintain and repair when one cannot access foreign spare parts. I would also avoid high-tech equipment whose use will benefit only the elite. Instead of supplying brain surgery units for Pyongyang hospitals, I would prefer sending stethoscopes and bicycles to local doctors. My project will have to include a major educational component. Knowledge sharing is becoming a crucial necessity as the DPRK opens to the rest of the world. This may involve sending experts and teachers into the DPRK. But even more important will be opportunities for North Koreans to travel abroad to attend conferences, take part in familiarization visits and participate in training courses. Too many assistance projects become a “flash in the pan” of no lasting consequence. If I cannot rely on my donor to repeat the grant of one million dollars after the first year, I would probably opt for turning the one-time grant into a smaller three-year operation. Considering the scale of the problems involved, one million dollars is a small amount relative to the needs. Whatever I choose to do, I would want to formulate projects that have the potential to be copied or multiplied by local authorities in order to reach an ever-larger number of people. There is no such thing as a perfect humanitarian delivery. Every nation in the world, rich or poor, autocratic or democratic, makes sure that its military and its elite are well fed and well supplied. Diversion is a fact of life that all humanitarian operations worldwide have to factor into their accounting, no matter how open is their access or how meticulous their monitoring strategies. But there are ways to choose projects that are more resistant to abuse and more effective for the broadest sector of a local population. That brings me unavoidably back to the original question: What works best in the DPRK? Or in my alternative version: What will work best for me and my million dollars? To be honest, at this stage in our relationship with the DPRK, I am less concerned with what works best and more concerned with encouraging more individuals, more organizations, and indeed more countries to become involved at all. We must not let the best become to enemy of the good. When it comes to North Korea, I’m a fan of the “let-a-thousand-flowers-bloom” school of humanitarian assistance. Every project is a learning opportunity, not only for the receiver, but also for the giver. We cannot anticipate all eventualities, nor should we be afraid of them. I would divide the amount into a three-year project to supply healthy drinking water and sanitation to three communities in remote areas of the countryside. The location is flexible. I have been personally involved in a World Vision International water and sanitation project that has already been replicated three times with excellent results. It pipes water from sources in the surrounding hillsides to a group of villages in the valley. 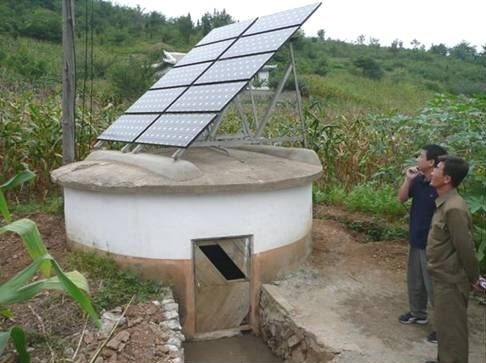 It uses gravity-fed technology, augmented with water from drilled wells using solar powered pumps. The water is collected in a reservoir and piped into schools, clinics and individual homes. The impact is felt immediately and has a long-lasting effect. Clean water is a crucial part of both nutrition and health. Benefits accrue to one and all, but women and children have the most to gain. Building materials are relatively cheap and easily repaired. Surveying, planning, preparation, scheduling and organization of labour is carried out together with local officials. International technical people make repeated visits for the duration of each project and teach local people maintenance procedures. All manual labour in digging, pipe-laying and construction is carried out by the local population. This collaboration builds a lot of goodwill and positive relationships. Once in place, there is little worry about diversion of materials. The projects can be combined with capacity building for health professionals. This may include the production of literature and posters to illustrate the importance of water and sanitation to health and nutrition. Training trips for North Korean technical personnel to similar projects overseas can be considered, with a view to equipping a North Korean professional team that can replicate projects like this across the country. I also have excellent potential partners in Canada who have the relevant expertise to implement such a project. great article Erich. What can human rights organizations like Amnesty International do to help? The government itself is difficult, but many of the people facing challenges are ordinary North Koreans. Absolutely fantastic article Erich. You ask all the right questions, and most importantly show that even a simple question has so many different possible and correct answers that it can paralyze decision making processes. However, your clear response to supply clean drinking water to the poor regions of the DPRK is impressive. If I had the funds, I would be more than happy to help.